COLOMBO, March 25 - Sri Lanka's protracted and increasingly bloody civil war is making the country more vulnerable to human trafficking, a senior United Nations official said on Tuesday. People fleeing conflict-torn areas in Sri Lanka's north and east, where fighting between Tamil Tiger rebels and state security forces has raged since 1983, opened the door to people smugglers keen to profit from the vulnerable, the United Nations said. "The conflict you have is quite clearly going to be a major factor in increasing vulnerability of some of the country's young people," Gary Lewis, representative of the U.N. Office for Drugs and Crime in South Asia, told Reuters. "Migration is the key in which traffickers and traffic victims meet," Lewis said after a briefing in Colombo. Sri Lanka, a developing nation of 20 million, has one of the lowest incidences of people smuggling in Asia, despite the ongoing conflict which has claimed 70,000 lives. Lewis's office estimates at least 150,000 people are trafficked within South Asia each year, led by India and followed by Nepal, Bangladesh and Pakistan. 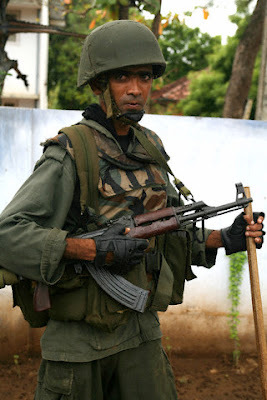 But with fighting intensifying between government troops and the rebels, the U.N.'s refugee agency UNHCR says around 188,000 Sri Lankans have been forced from their homes since April 2006.